CONTEST: 2 Tickets to City Lights (Big It Up's 15-Year Anniversary) feat. Tanika Charles, Ian Kamau and more! You know we always try to hook you up when we can so shouts to BIU for linking the free tix to their 15-year anniversary event (“City Lights”) taking place this Saturday night at The Great Hall. It’s a celebration b*tches! Plus…you get to see 2 of the best live performers in the city right now, Tanika Charles and Ian Kamau (as well as many more). Should be a dope night so if you’ve ever blessed the dome with a BIU joint then there’s no reason not to be there. We’ve got 2 pairs of tickets for the night so…the first 2 people to e-mail cityonmyback@gmail.com and tell us the name of Big It Up’s Queen Street store can tell their best friend they won something today. Everyone else can pay at the door with ALL proceeds going to a charity initiative called “Youth In Time” in support of young adults on a cancer journey. *UPDATE: Congrats to Bryan from Toronto for taking home a pair of tickets! 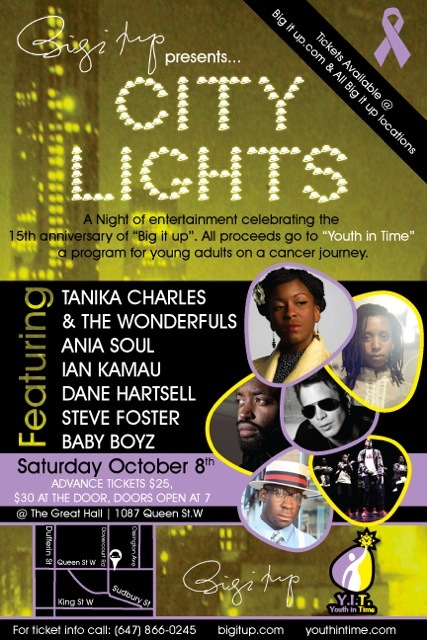 Previous: EVENT: Big It Up 15 Year Anniversary w/ Tanika Charles, Ian Kamau & More! 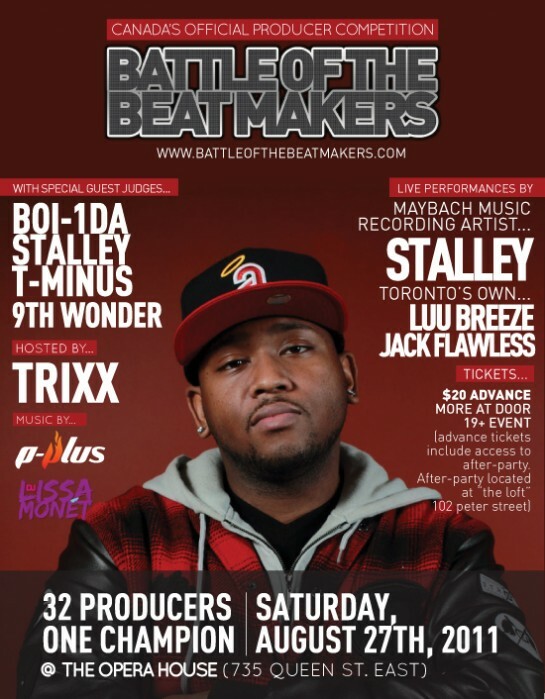 TORONTO, ON – This year’s 2011 Battle of the Beat Makers event brings A-List producers 9th Wonder, Toronto’s own Boi-1da and T-Minus, and Recording Artist Stalley of Rick Ross’ Maybach Music Group as guest judges to determine who will take this year’s coveted title of top beat maker. This year’s expansion of the Beat Battle into a multi-tier three-day affair is guaranteed to be a must-attend event for all aspiring producers and music lovers alike. At the heart of this event is the Main Event where 32 finalists will compete live on stage battle-royale style for the Champion Trophy, winning over $10,000 in cash and prizes. 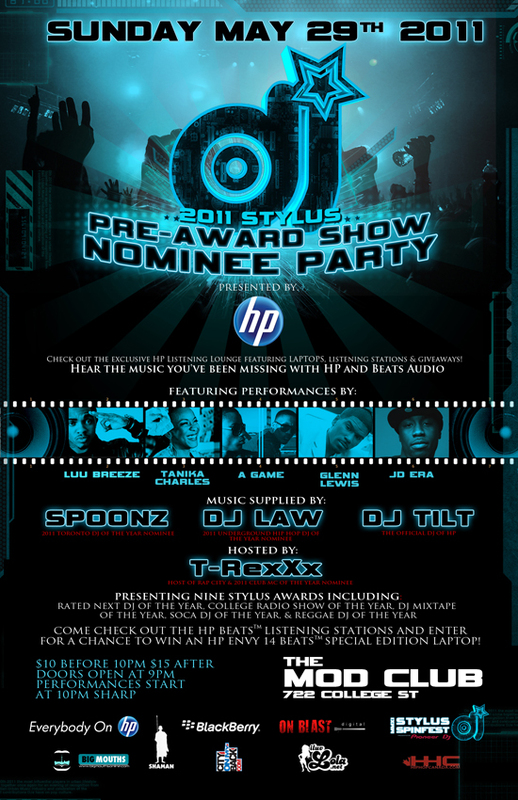 It all goes down August 27, 2011 at 8 p.m. inside The Opera House, 735 Queen St. E. With comedian Trixx returning as this year’s host and rising hip-hop stars Stalley, Luu Breeze and Jack Flawless taking the stage, this is a show not to miss. The weekend will kick off with a Beatz-N-Rhymes Meet & Greet where the 32 finalists will be able to mix and mingle with industry elite and artists. That night, lottery-style, the first-round battle face-offs will also be determined. Next up is the interactive Pro Audio Conference, which will include a Keynote address from 9thWonder, interactive panels on everything from branding to licensing, a critique session where producers will have an opportunity to play a snippet of their work for past BBM winners and live demonstrations from FL Studios and Roland. On the final day, a beat auction will provide select producers with the opportunity to auction their work to artists and companies seeking out production and Grammy-Award Winning 9th Wonder will be presenting his “The Wonder Year” documentary at a special debut screening. Registration for the competition closes this Friday, August 20, 2011. Producers are encouraged to visit http://soundsupremacy.com/sse/?page_id=8 to register now. Founded in 2005, it was created to assist Canadian music producers lacking a platform to showcase their talents in a live setting, as well as to provide networking and educational opportunities to ensure their growth and development in the global music industry. BBM was birthed to be that national platform. Since then, it has showcased over 200 producers in a live setting and attracted over 1500 producers across Canada and abroad seeking to get involved with the BBM movement. Most notably, it is the forum responsible for discovering both 2X Grammy Award Winning and Multi-Platinum Selling Producer, Boi-1Da, as well as, Grammy Nominated and Platinum Selling Producer, T-Minus. It’s about that time again Cityonmybackpackers. First 3 people to tweet “i got the @cityonmyback” are taking home a pair of tickets to The Stylus Awards (May 30th @ The Queen Elizabeth Theater) AND The Pre-Awards Party (May 29th @ The MOD Club). Bom bom. Get all the Stylus Awards info at www.stylusgroup.ca! UPDATE: Congrats to our winners @RedwayMusic, @Najat_M & @Kelly__Ross!!! The first two people to correctly email us (cityonmyback@gmail.com) the part of the GTA Rich Kidd hails from (Scarborough, Pickering, Mississauga, Brampton??) will each get a pair of tix to the show this Friday! SmashMouthEnt for more info. 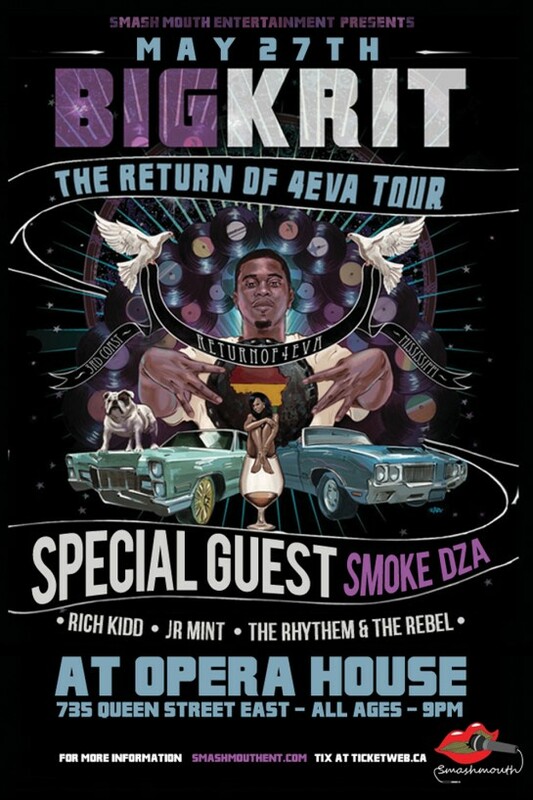 TicketWeb for tickets. The freestyle saga continues as Church Chizzle goes up against QShinobi. It eventually goes to a rematch and Church takes it on crowd response. Honestly they should just automatically disqualified whoever fails to use all three words. If both contestants fail to use them – then rematch. Problem solved. 2 tickets to Classified‘s show this Saturday at Sound Academy! 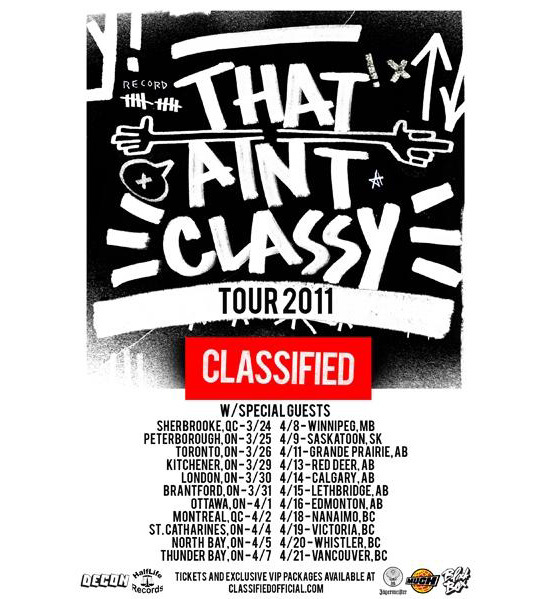 Looking for the 5th person to e-mail us at cityonmyback@gmail.com and tell us who directed the “That Ain’t Classy” video. Easy right? WINNER: Aman from Toronto! The correct answer was: Harv. Shouts to CBC for holding what will surely be a great event! It’s a live taping and space is very limited but we’ve got TWO tickets to give away to the 5th person to send an e-mail to cityonmyback@gmail.com telling us 3 collaboration songs between any combination of the artists below. Good luck! 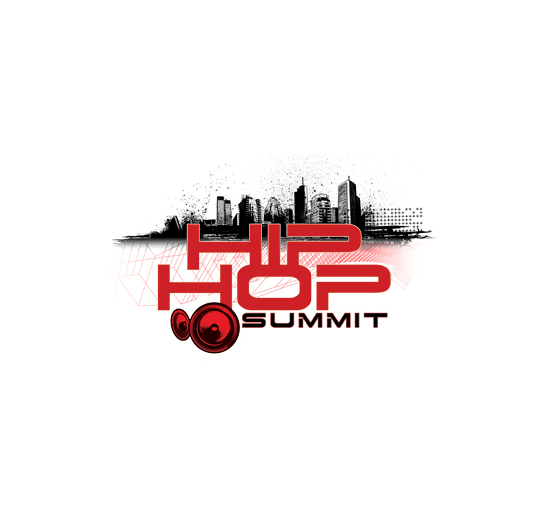 For more info on CBC’s Hip Hop Summit visit CBC.ca/HipHop! The live taping will feature legendary Canadian hip hop artists from the past 25 years, including : k-os, Kardinal Offishall, SHAD, Saukrates, Classified, Maestro, Michie Mee, Red1 of The Rascalz, Choclair, Ghetto Concept, Reema Major, Cadence Weapon, Skratch Bastid and many more. WINNER: Congrats to SHAUN from Brampton for winning the tickets! Thanks to everyone that participated! Previous: NEWS: CBC partners with Manifesto on the HIP HOP SUMMIT! Good to see a Major stepping up to the plate and trying to create a more organic connection between themselves and the infinite indie artist market. Today at Canadian Music Week, EMI Music Canada officially launched a mobile music community, Mobile Artist (MOA). This new interactive platform allows for the promotion and discovery of new music and emerging artists. Both artists and fans can register at www.MOArtist.com ™ and then access the platform from their smart phone devices or by going online. Independent artists will be able to create a free mobile site in minutes, post their digital content as well as send free SMS alerts to their fans. The content and interaction with fans that these Canadian artists generate through MOA will be essential as they compete for fan votes. The competition will take place over a period of nine months, with five finalists selected every three months – resulting in all Top 15 finalists being part of a special EMI digital compilation. The overall winner of the competition will have their single released and serviced to radio by EMI Music Canada. The competition is currently only open to Canadians – all rules and regulations are available on the website. CALLING ALL PRODUCERS, RAPPERS, & SINGERS. If you would like to take a stab at remixing Andreena Mill’s current single and gain the opportunity to be a part of her highly anticipated project ‘All Eyes On Me’ now is your chance. Happy Monday! In light of this great day we’ve cooked up a likkle contest for you and a friend to check out Rich Kidd, Smash Brovaz and Blake Carrington opening up for Pac Div tonight at Revival! 10th person to re-tweet this blog post with #High&Hello added to the RT gets hooked up! We @cityonmyback if you didn’t know.